I could not be more grateful for my father’s acceptance of my vegan lifestyle. In the past few months he has adopted a vegetarian diet, eating vegan during our shared meals together, and has developed a curiosity in vegan recipes. He bought a cookbook called The Vegan Cookbook, which has simple and delicious no nonsense recipes. 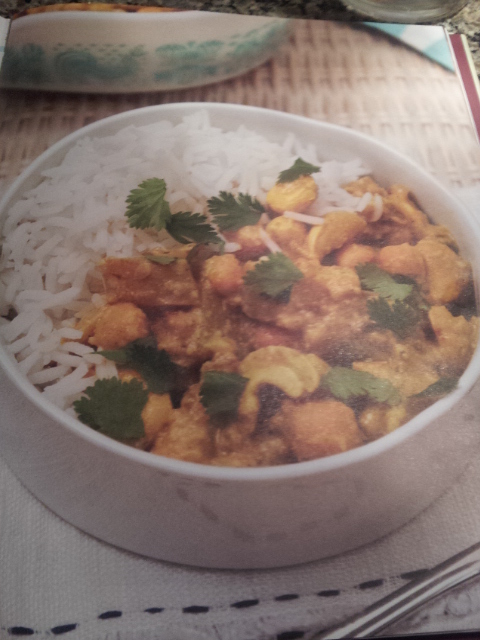 This chickpea and cashew curry is amazingly delicious and made a great packed lunch the next day. It attracted some attention from the people I was eating lunch with, and prompted me to type out and share the recipe. This is the first recipe that I will post that I have not actually made myself. Here is one hearty winter dish to get through the cold months. First, cook potatoes in boiling water for 10-15 minutes, until tender but still firm. Next, heat oil in a saucepan, then saute onions, garlic, ginger, cumin seeds, chili powder, tumeric, and cinnamon until the onion is soft and translucent. Add the drained potatoes, chickpeas, and cashews, and cook for three minutes. Stir in the stock and coconut milk, then reduce the heat and cook for another 15 minutes, until thick and creamy. Garnish with cilantro and serve with cooked rice. I can’t seem to find the cookbook online, as I have no author to google, and the title of the book is quite vague. If you do happen to come across it, I also tried and enjoyed the spicy stuffed bell peppers and thai vermicelli soup. Also, I wish I had my own picture, but here is the one from the book. I have that cookbook and everything I’ve made from it has been simple and delicious! I am currently away oversea but had a hankering for this specific curry so I am so happy I was able to find this recipe. Thanks for posting !